THE GRAND MASTER OF THE MONOLOGUE . He has been called by all the well known artistes of the Kashmir valley, the greatest monologist of the time and till this date any such monologist of his ilk has yet to appear in the valley of Kashmir. All the monologists who were his contemporaries and thereafter who jumped in the field have acknowledged their debt to Pyarey Lal Handoo who used to be a household name in the valley of Kashmir in the art of mono acting. When Radio Kashmir, Srinagar was at its peak in the year 1960 to 1975. Late Mr Pushkar Bhan, Producer emeritus of Radio Kashmir, Srinagar used to produce the famous “MACHAMA” series from Radio Kashmir, Srinagar .There were two important characters in the series namely “SINGARI” and “ZINGARI”. Both Singari and Zingari were the daughters of a demon. One of the characters was portrayed by P L Handoo. The series would be broadcast at 9.30 PM on a fixed date of the week and on every next day and sometimes even for weeks together, the dialogues spoken by Singari and Zingari would be on the tip of the tongue of every one in every household. College going students (male & female) would name their friends by Singari/ Zingari and enjoy the dialogue delivery style of the characters by delivering the dialogues of the plays. Handoo achieved all this by deliberately schooling himself to a style created by Handoo himself, not known to any one else and the same was direct, precise and terse. He used to say and strive to give a musical quality to each of his word spoken by him in a monologue. His subjects for a monologue were also of the most ordinary kind . His greatest quality was that he created a monologue on any theme or any subject. Once he picked up the nearest character within his reach, he had the talent to reproduce it in the same way as the original character would be. He saw in every aspect of his life the themes of utmost fascination. To this facility for simplicity, he added a compactness of style that would, with the minimum of words illumine the most of the minds by his innovative, selective and well constructed words. His essential humanity and humility urged up all in his monologues. He scorned nobody as being beneath notice. He saw beauty in the drabbest of lives and caught those fleeting moments of loveliness in them and enshrined them forever in his masterly delivered monologues. He never made “types” of his characters in any of the specimen of his mono acting nor did he set himself as an infallible judge over them. His was a clinical approach. He accepted them and presented them as he found them. He had the gentlest irony in his armory and he poked delicate fun at the absurd and the pretentious. Very clearly, Handoo was a monologist to the core, so responsible of humor that when he would be in any company whether of friends, relatives or for that matter a number of people called audience of any sort  he would bring about a revolution by the art of the delivery of his monologue. His technique of conceiving and delivery of monologue brought in a directness, naturalness and vigor that went straight to the heart of audience. A number of awards and honors have been received by him from time to time for his stage and screen performances. Born to Late Kashi Nath Handoo of BRAIKUJAN, Srinagar, Handoo was the eldest brother of the five sons of Kashi Nath Ji. From the early years of youth, Handoo had been associated with theatre. His association with ‘NAVRANG DRAMATIC CLUB“ is really worth mention. It is at this place where he learned the nuances of the theatre and refined the art of acting to be a perfectionist. Though he has acted in a number of plays but his acting in the Kashmiri version of “GODAN“ of Munshi Prem Chand has been highly commendable. Prior to joining the audio visual medium i.e. Doordarshan in the year 1975, approximately as a Production Assistant, Handoo worked in the P&T department at Srinagar, Kashmir. He took care of “Asun Te Gindun“ for some time at Doordarshan, Srinagar, but his whole hearted and continued love for the programme “BUTRAT“ is worth mention. “BUTRAT“ was a programme for the agriculturists of the valley. The programme in addition to other segments engaged a number of agriculture experts for the presentation of expert opinions and tips and hints on best agriculture produce. The programme was a highly liked and widely viewed programme of Doordarshan, Srinagar . In the year 1990, he had shifted to Doordarshan, Jammu where he reached to the promotional stage of the rank of Deputy Director. Here, also he worked untiringly and whole heartedly, though he showed signs of diabetes which made him a little run down so far his health was concerned. In the morning of tenth of June, 2016, he breathed his last and the man of many voices went silent, but the multifarious voices delivered by him in the monologues of variety will echo in our minds for all times to come. 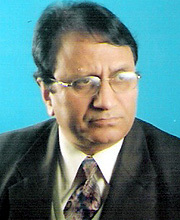 *M. K. Raina Ratnakar is an Indian Broadcasting Service Officer (Retired). He has retired from Prasar Bharati (Broadcasting Corporation of India), Doordarshan, as Deputy Director General, from Directorate General Doordarshan, New Delhi. 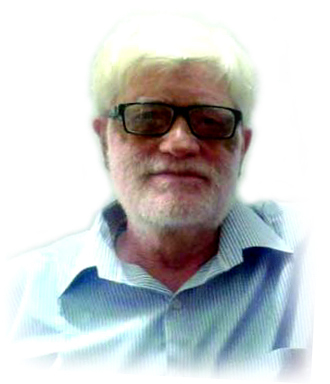 He has authored a number of books, the known amongst which are “Intruded Moorings“, “Surreal Moments“, “An Intelligent Parent’s /Teacher’s Guide to Success & Achievement of The Child “ and “Spoken English Skills,’’.